Home / airlines / news / Air Vistara upgrade voucher issues! Air Vistara upgrade voucher issues! 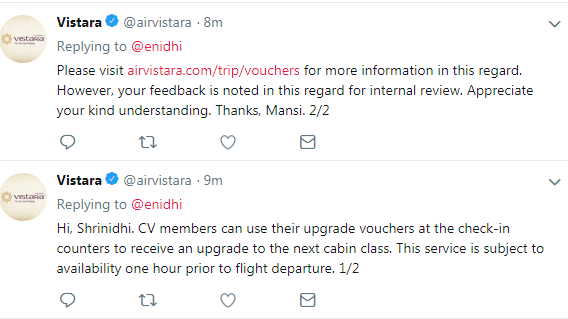 Update: Recently Vistara is allowing upgrade confirmation much in advance. Here's a first hand experience as to how reputed airlines like Air Vistara tricks its customers. September first week I received below email from Air Vistara. This email promised me a free upgrade, if I fly with Air Vistara before September 30th. It said voucher will be sent within 20 days and can be used during booking/check-in of a future flight. Note that email clearly says "Booking/Check-in". Implying upgrade can be done upon booking. I did fly Air Vistara between Chennai and Kochi in September, before the deadline. My detailed Air Vistara first flight experience in this post. 20 days later, I did receive my upgrade voucher. All fine and fair till this point. I call Vistara customer care and ask them to use this voucher and upgrade my 2019 ticket. I was given a shocker "The upgrade is possible only at the airport and if and only if seats are available"
This statement was never revealed anywhere-they make people buy tickets with a lure of upgrade and then wash their hands saying "only if available". So now, I need to depend on my luck. The tweet mentions a link where their new rules are defined- these rules were not included in the initial email, nor the link. How am I supposed to know these limitations? How hard it is to include in the email that upgrade is subject to availability? 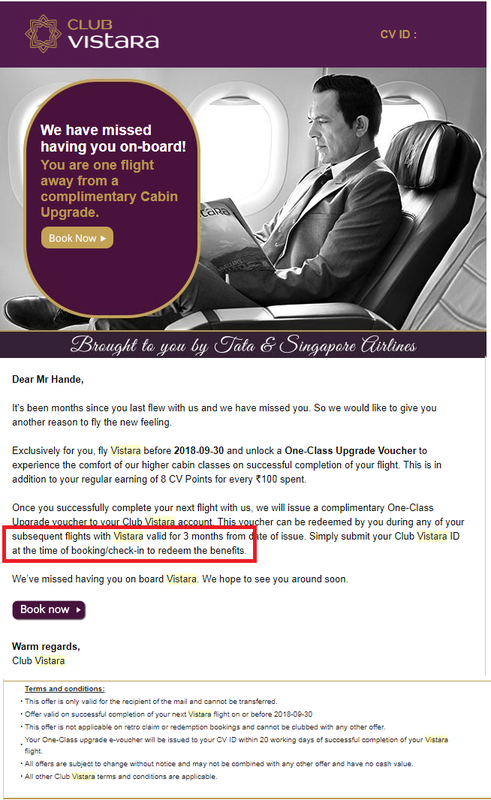 Vistara's social media team is unable to give any response when questioned "where are these terms or a link to it in the email", "why does the email say 'booking/check-in' if offer is to be availed only during check-in' etc. If I was clearly told that the upgrade is luck based (subject to availability)- there is no guarantee of any upgrade, I wouldn't have bothered to book new tickets. Is it wrong to expect some honesty and straight forwardness? I am sure they would have tricked lots of people in similar way- sending a misleading email that does't fully disclose the limitations, make people spend money and then slap then with new rules that takes away any chance of them getting any benefit. Vistara is the only airline left in the Indian skies without any image crisis. More and more people are turning to Air Vistara given the crisis with other Indian airlines. Last thing they want is to leave their customers feel cheated. At the minimum be honest and disclose every critical info when you're sending some promotional mails. I have a counter offer for you Air Vistara- I will pay you 5 lakh rupees for a Chennai-Delhi ticket....Sounds great? good, issue me a ticket. Fine print is that I will give you 5 lakh rupees only if I have that much cash with me on the date of flying.- else I am sorry, you've to fly me for free!.. Sounds disappointing? That's exactly how your upgrade promotion is being done. I will probably live without my upgrade. But with shaken trust, I will be extra careful in future not to take any of Air Vistara's offers at face value. Have to first ask for all hidden terms and conditions, then decide if the offer is worth. -Since I don't have a premium cabin ticket, I can't use dedicated check-in counters meant for business class. Do you agree my reasoning is fair? Similar: Jet Airways bid for upgrade scheme more expensive than buying new premier ticket. * Vistara Economy Lite fare without food. AirAsia X value meals combo deal worth it? Is this the longest leg room ever on a plane?